D4 Thermal Shock is weight loss supplement formulated to help the consumer have more energy, all without the jittery uneasy feeling and the subsequent energy crash. Apparently, with just one pill D4 Thermal Shock delivers plenty of energy and focus, and according to its own website is the most potent thermogenic pill available. Our team of researchers and weight loss enthusiasts are always on the hunt for new and effective products that liken themselves to the best around. So let’s take an in depth look at D4 Thermal Shock and see how it compares. The D4 Thermal Shock combines all natural ingredients such as amla fruit, caffeine, and white willow bark, etc., to create its formula. The product is brought to you by Cellucor, a notable company that has produced a line of impressive, high quality products. So how does D4 Thermal Shock compare? It appears the effectiveness of this product is entirely dependent on the type of consumer who takes it. Seeing as D4 Thermal Shock brings a huge increase in energy levels, this diet pill is only suited for those who undertake large amounts of exercise regularly. So casual dieter beware, this product is dependant on the consumer getting pumped full of energy and working out harder, longer, and faster every time they take the pill. However, even athletes may want to heed a warning, this product is shown to contain some dietary ingredients that - although legal in general - may be prohibited by individual sporting organizations. Additionally, there is a huge list of restrictions as to who should take this product and who should not, mainly having to do with the amount of caffeine and other stimulants D4 Thermal Shock incorporates. Mainly, the side effects associated with D4 Thermal Shock are those typically caused by overindulging in caffeine: headaches, dizziness, confusion, clouded vision, bloating, rash, nausea, vomiting, increased urination, jitteriness, dehydration, increased blood pressure, heart palpitations, problems sleeping, the list goes on and on and the full document of warnings is available on the product website. In rare albeit some cases, another ingredient the product incorporates, Yohimbe, has been linked to kidney failure, seizure, and heart attack. Comes an entire library of side effects, warnings, disclaimers, etc., etc. Product is also quite expensive at about $100 for 120 capsules and is only intended for the highly active dieter. Additionally may contain some ingredients prohibited by sporting organizations. 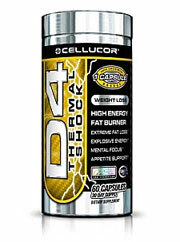 Although D4 Thermal Shock does seem to provide a huge boost in energy (and by way of this, an increase in thermogenic processes too) this supplement is only intended for the highly active athlete. Casual dieters should avoid this product entirely as the list of side effects is incredibly lengthy and not worth the risk. Needless to say, there is plenty of caffeine in the product, as well as Yohimbe, which has been linked to some fairly intense side effects (albeit rarely) such as kidney failure and heart attack. In our recommendation, unless the user is a high level athlete with plenty of knowledge and know how pertaining to the supplement world, consumers should avoid this product and go with a more flexible supplement containing less stimulants, side effects, and warnings. Bottom Line: D4 Thermal Shock is not for the faint of heart nor the casual dieter and the consumer should be warned: the side effects are no joke and worthy of intense scrutiny and assistance from a medical doctor.